OUR SLINGSHOT SHOP HAS BEST PRICE GUARANTEE! There is no such thing as a "cheap RPM" because superior quality and the best flying performance has its price. And this is what the Slingshot RPM is known for. You don't even find a cheap RPM in the second hand market ... with the RPM's superb quality and solid re-sale value. But our prices are as inexpensive as it gets with the Slingshot RPM and other kites. ON SALE! 2018 & 2017 Kites 30% .. 35% .. 40% !!! We deliver kites in South Africa FOR FREE. We deliver kites to our Customers in Europe FOR FREE. 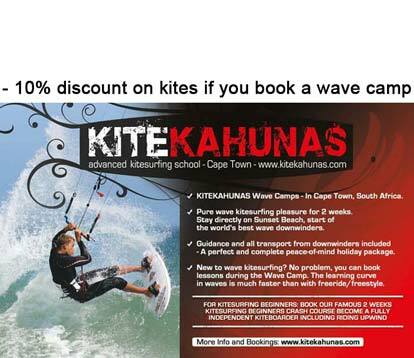 For the best deals please come to Cape Town for a kitesurfing holiday. Tourists can claim 15% VAT back at the airport when leaving. KITEKAHUNAS Customers may qualify for further discounts. Our Customers sometimes ask, why the boards of previous years are not discounted. The reason for this is that our non-discounted boards have exactly the same shape as the newest models, but only different graphic designs. And this, as you know, is entirely up to taste. Further prices on request. Please send us an email. 2019 RideEngine Futura Surf Foil Package (for surf boards), or the identical Slingshot HoverGlide FSurf, with 1 mast. 2018 RideEngine Futura Surf Foil Package (for surf boards), or the identical Slingshot HoverGlide FSurf, with 2 masts.